There are many things Scott and I enjoy doing together, but cooking is one of our favorite activities. We can spend hours reading through cookbooks and shopping for ingredients. There is something so therapeutic about chopping, dicing and sautéing ingredients to create an edible piece of art. Plus, it’s a great couple’s skill-building activity—to work together as a team with an end goal in sight. 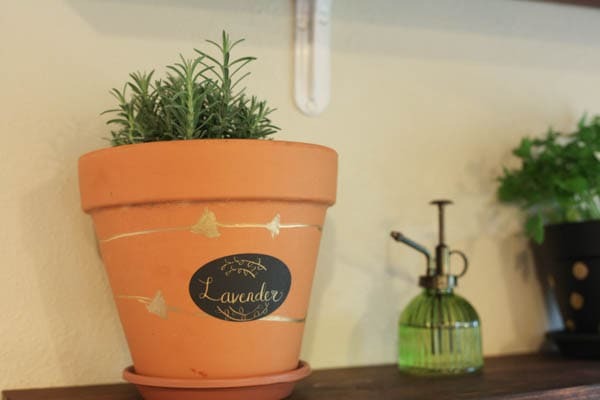 🙂 One thing that we have noticed that’s made a huge difference in both the presentation and the taste of our meals is using fresh herbs versus dried herbs, so it was always a goal of ours to plant a fresh herb garden for us to use. Our first plan was to do it in our backyard, but it’s so heavily treed and we have so little grassy space that we didn’t think they would do well there. 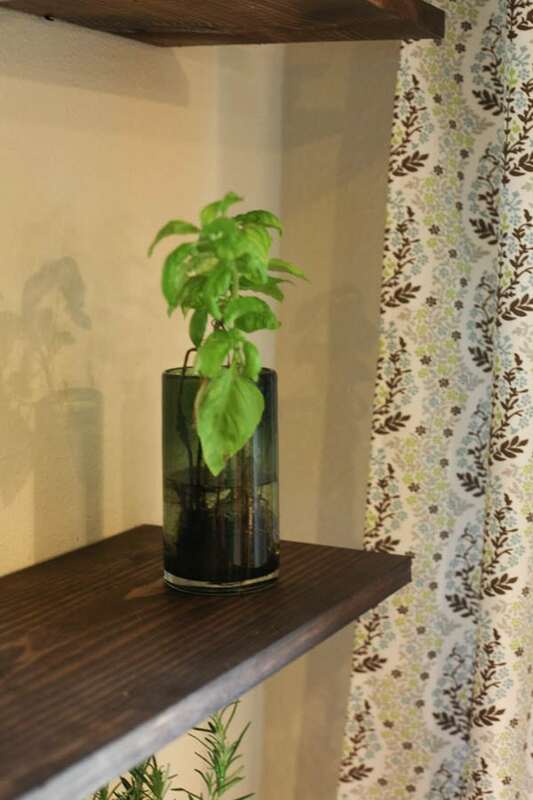 Then I began daydreaming about having an indoor garden of some kind, where we could snip our own fresh herbs. I mentioned it to Scott, and showed him the spot in the kitchen where I wanted it to go, and the idea quickly took off. 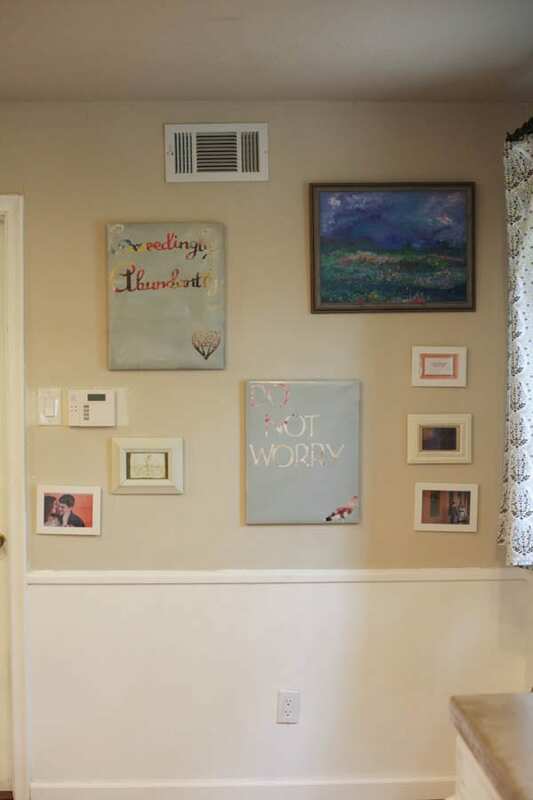 We decided to do three shelves on the wall in our kitchen that currently displayed art. 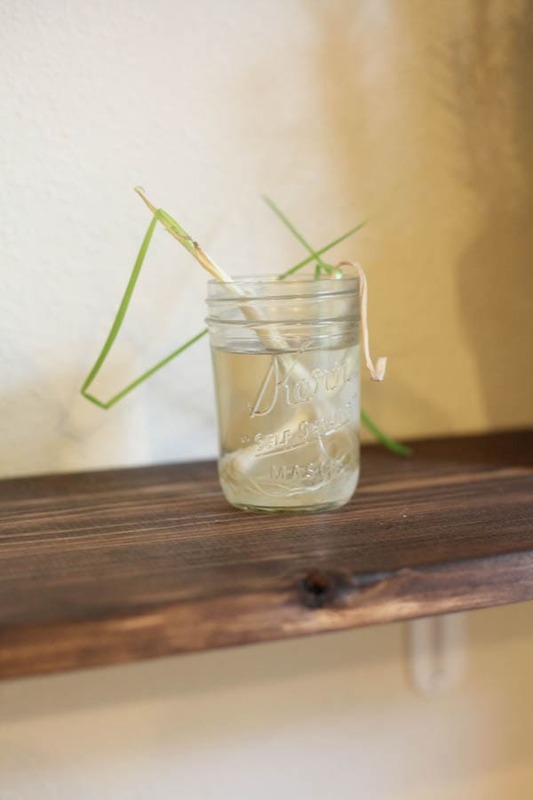 We had always viewed the art as a temporary placeholder until we came up with a more solid plan for what we wanted to do in that corner, plus there is a window that gets a good amount of sunlight there, so it was the perfect place for our herbs to grow. What’s amazing about this project is I communicated the entire idea to him over text. 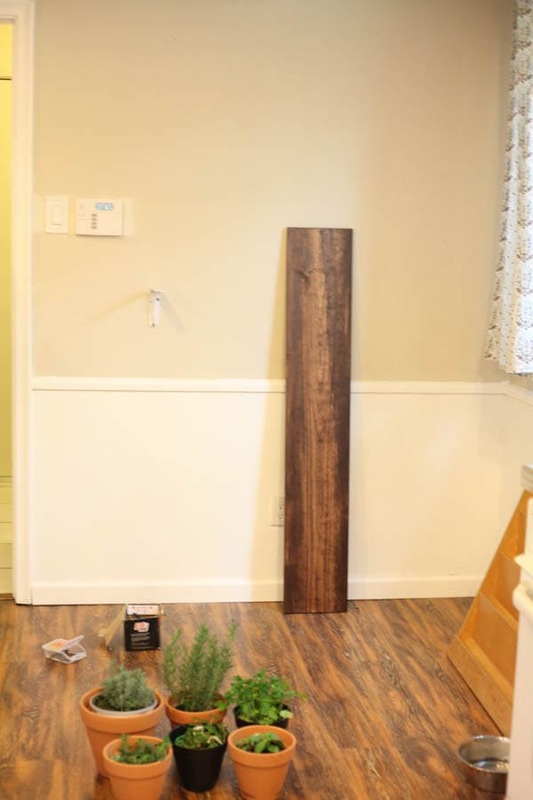 Messages like, “I want a warm, but dark, but vintage-y looking stain” and “I want brackets that are there, but not too there” were easily and successfully interpreted by my husband who went to Home Depot to pick up supplies for us. 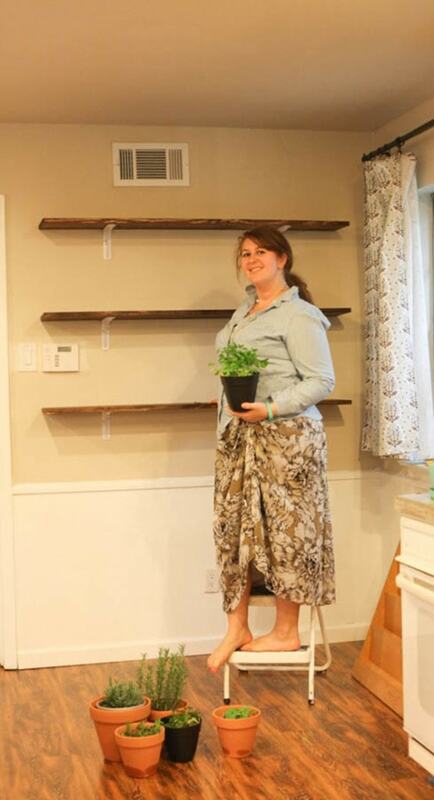 He had Home Depot cut three 1×8″ boards to be about 54″ long which gave us about a 6″ buffer on each side of the shelf. 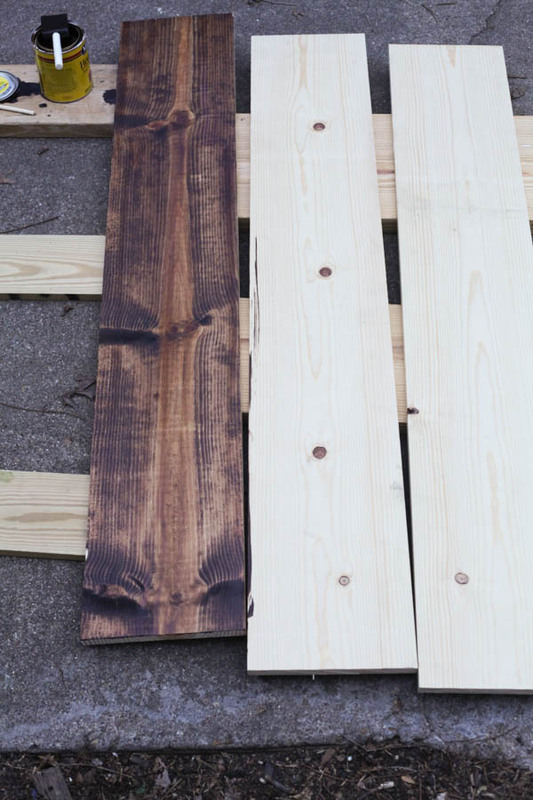 We stained them with Minwax’s Honey stain, which is a favorite of both of ours. After all three boards were stained we let them dry for about 24 hours before bringing them in to hang the brackets. In the meantime, we headed back to Home Depot to pick out herbs! Luckily right now is prime-time for herb buying—there are so many options! 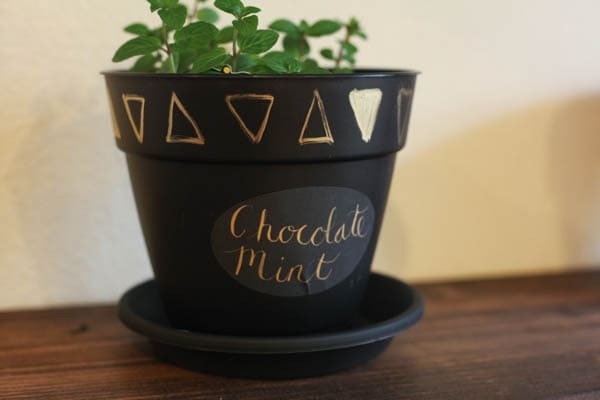 We spent about $20 and stuck with the ones that we thought we would use most often, and have the best luck growing indoors—basil, sweet basil, chocolate mint, lavender, rosemary and parsley. Our car smelled like springtime on the drive home—the herbs are so fresh and lovely! 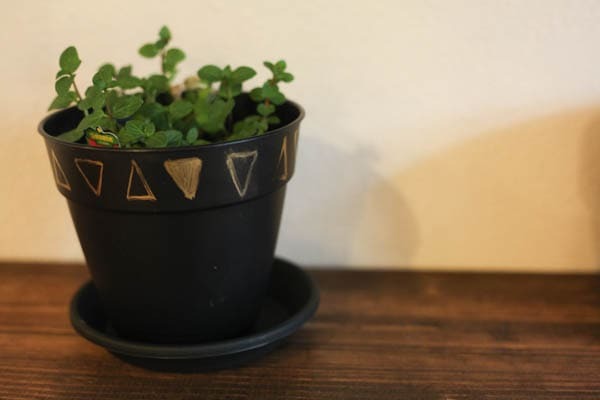 We also picked out some pots to go with them. 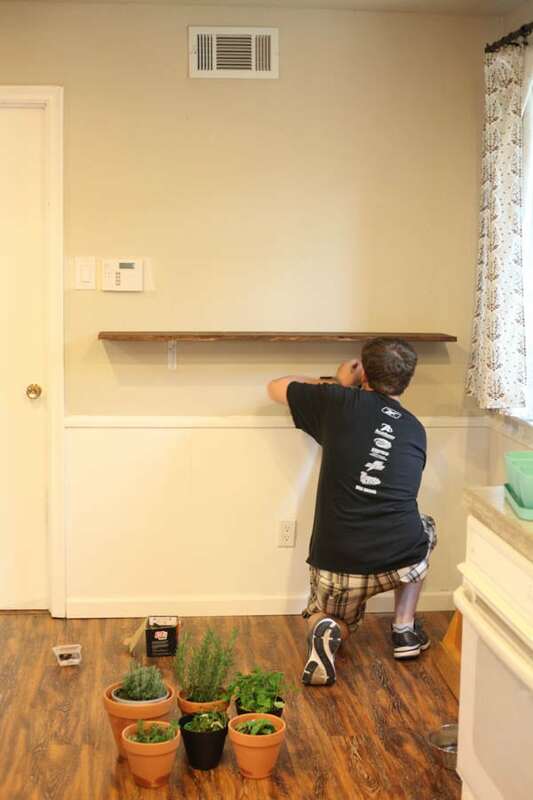 We then cleared the art off the wall and used a stud finder to locate the studs in the drywall so we could drill the brackets directly into them using wood screws. Scott used a laser level to make sure that every bracket was hung flat and spaced out correctly. 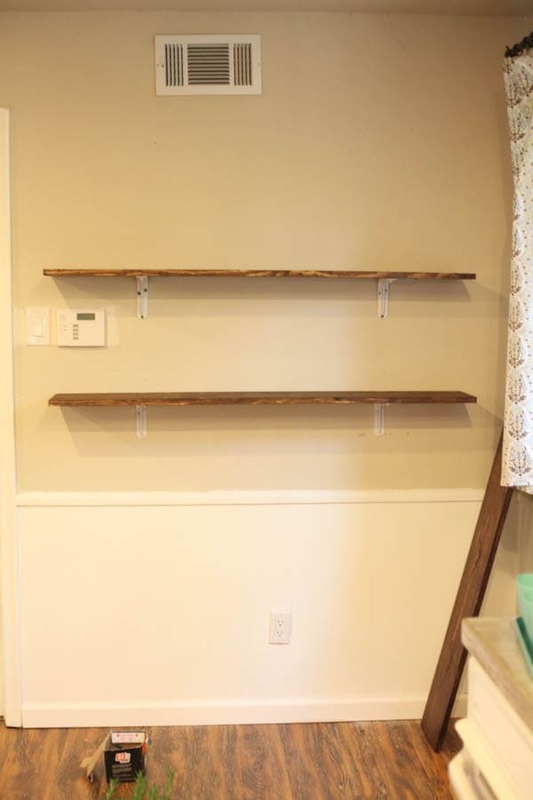 This was definitely the most time consuming part of the entire process, but it is well worth the time to make sure the shelves are sitting level! Soon all three shelves were in the perfect position and drilled into the brackets with screws to ensure they wouldn’t move around. 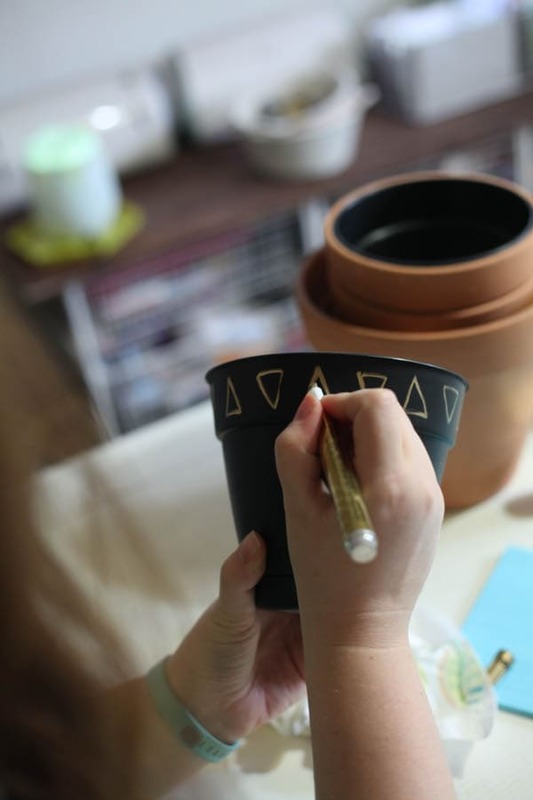 Then it was time to decorate the pots—woo hoo! 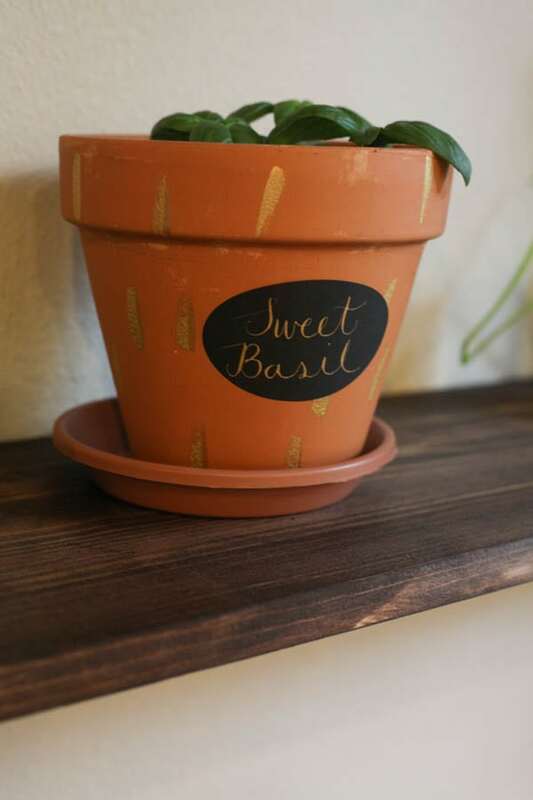 I grabbed several gold supplies, knowing I wanted to decorate each with gold accents for a cohesive look. 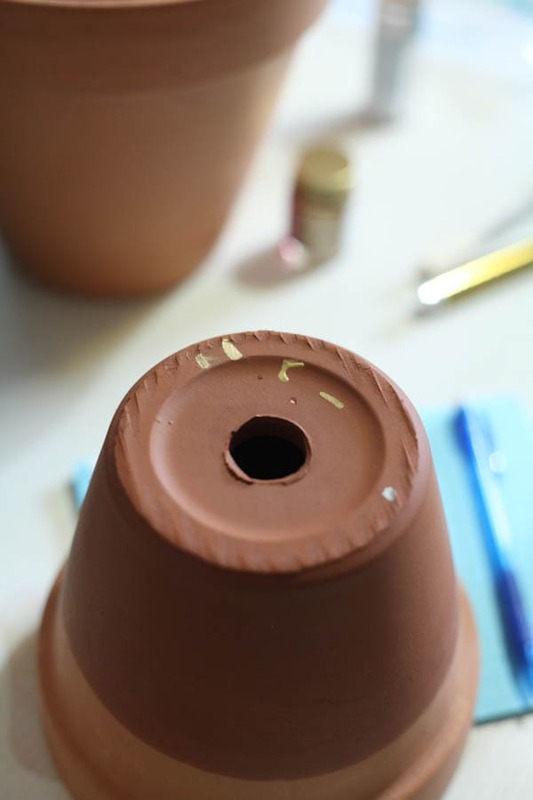 I then tested each of the materials on the bottom of one of the pots to ensure they wouldn’t smear or wipe off easily. All of them passed the test, so I used a variety of each to decorate with different patterns. 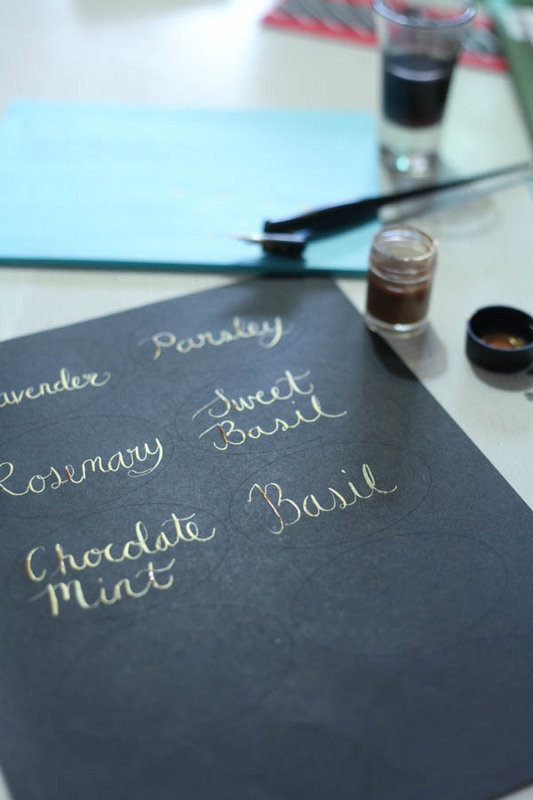 I also have been taking calligraphy lessons, and was excited to create labels for each of the pots using my favorite gold calligraphy ink. 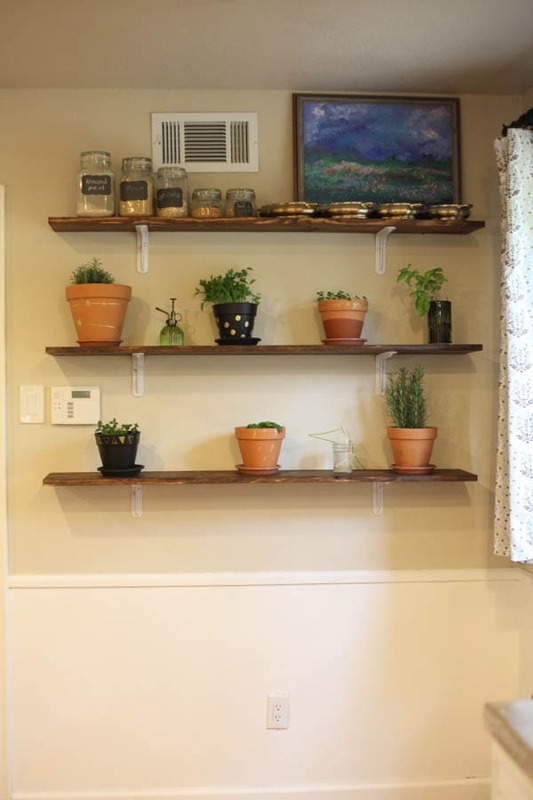 Once my pots had a chance to dry off a bit, I placed the herbs inside each and placed them on the shelves. 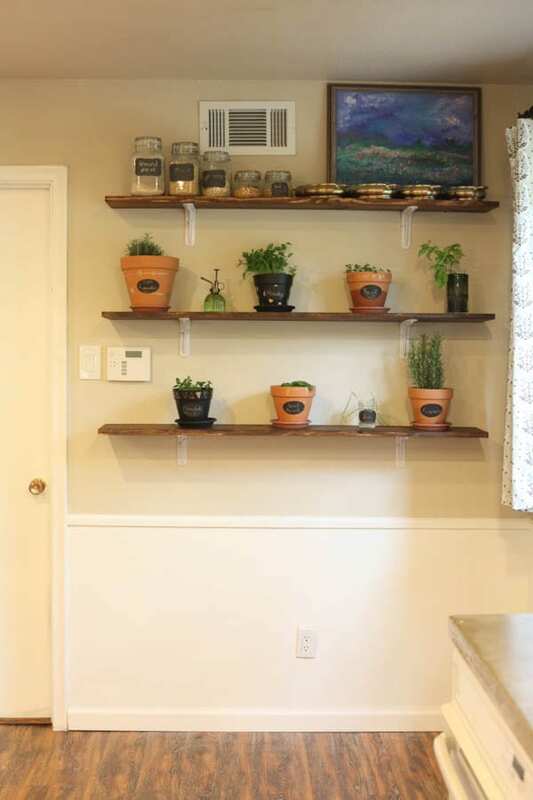 We decided not to use the top shelf for herbs since our air conditioner vent is up there and the top shelf is too high to be as accessible as we would like. We decided to use the top shelf to hold these pretty gold casserole dishes, and some dried baking goods. We even hung up one of my favorite pieces of art from the gallery that used to be on this wall. I love the green it adds to our kitchen, and how functional it all is! I’m really excited to experiment more with adding new herbs to dishes and cocktails, and to use them as garnishes. So far our herbs have done great! We haven’t had any issues at all—they seem to be getting the right amount of sunlight and water. Whenever we want to use some, we just use grab our kitchen scissors and snip off a bit. I do rotate the pots occasionally so they can each have a “turn” closest to the window. 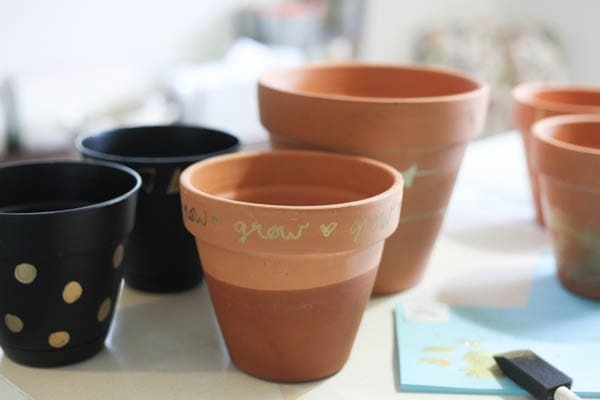 We also will place the pots on the windowsill about once or twice a week, just in case they need some more sun. 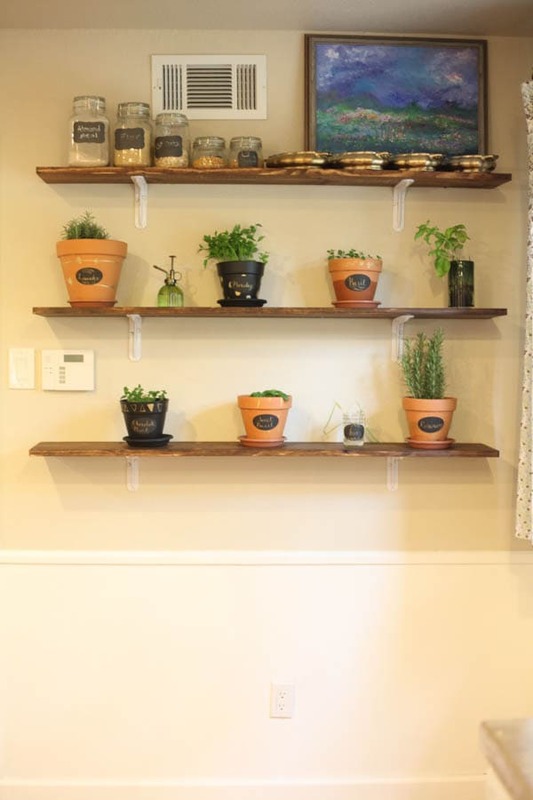 I absolutely love our little herb wall and the versatility it provides (along with how pretty it looks!)! Love this! I’d love to have one in my current kitchen, but there isn’t really anywhere for it… Maybe our next one! Totally! 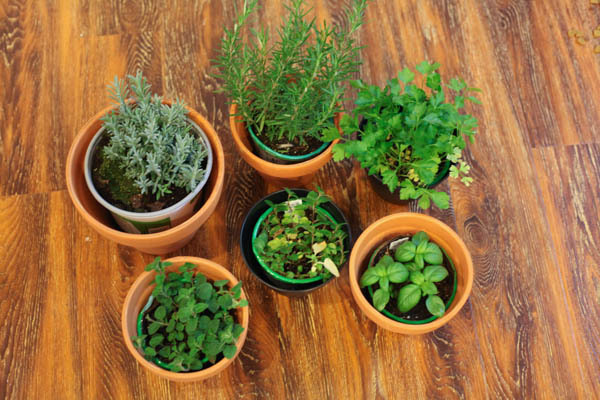 Or maybe even just one or two small pots of your favorite herbs on your windowsill. 🙂 I use basil by far the most out of all of mine! 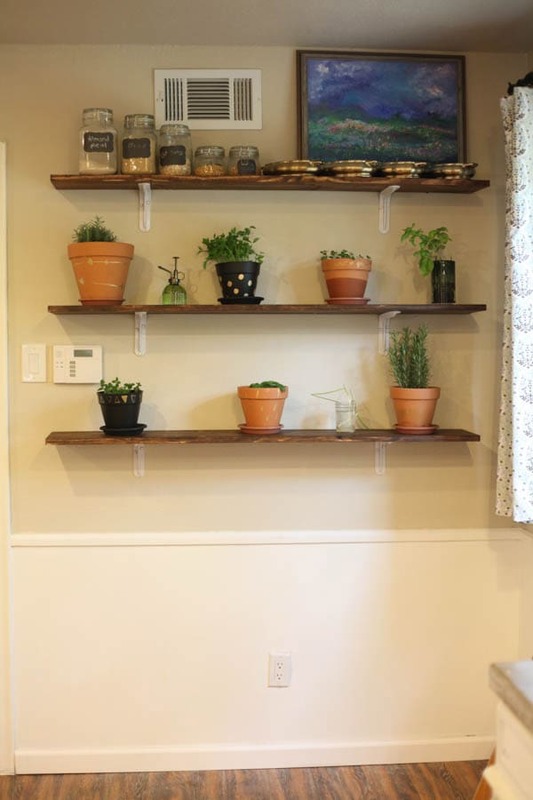 I love your herb wall! 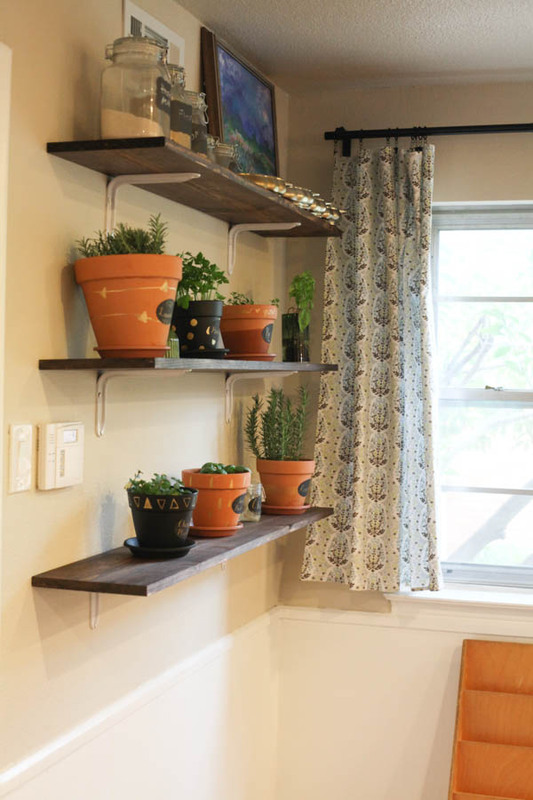 Between the pretty plants and pots it still is sort of a gallery wall. I adore how you mixed in the painting and the dishes. Great job! How fun! 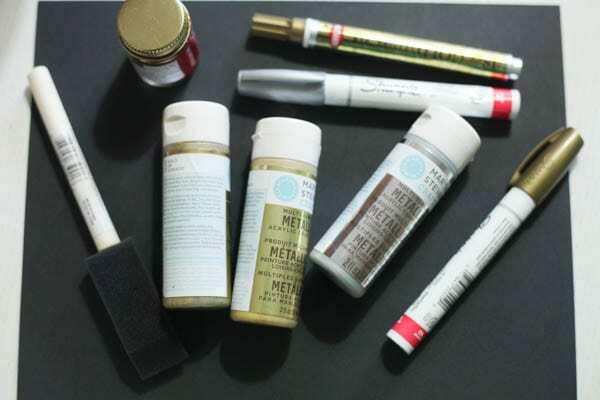 I especially love your gold calligraphy labels! Way to go girl! Cute! I love how you painted the pots. I don’t cook. I have a wonderful husband that cooks me dinner every evening 🙂 Plus I’m a plant killer. Thanks Samantha! That’s a good man. 😀 I like to cook so my husband can do the cleaning part, hehe. But we usually do it all together- or he will help me cook and then clean while I read. LOL. you two really are the perfect couple – it seems that your individual areas of creative expertise always combine into really awesome projects. have you considered opening at etsy shop together? You had me at functional! 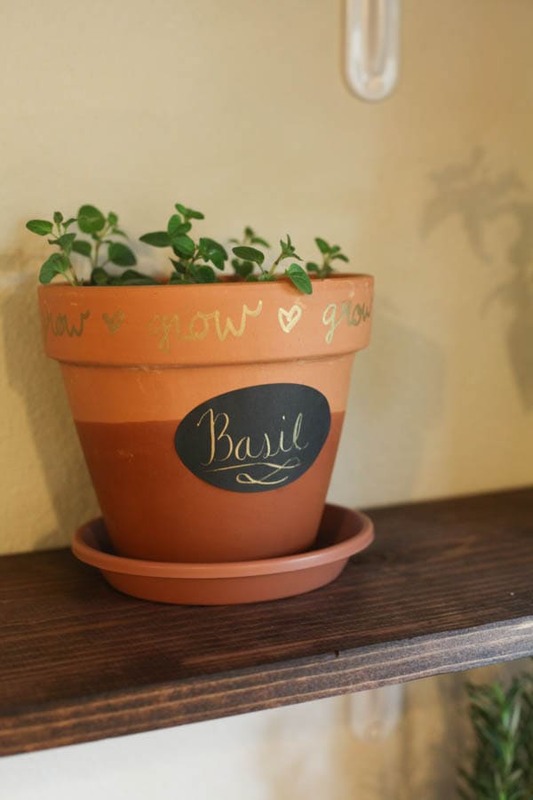 It’s so pretty – I didn’t know you could root basil – excited to learn that tip! What a great idea. 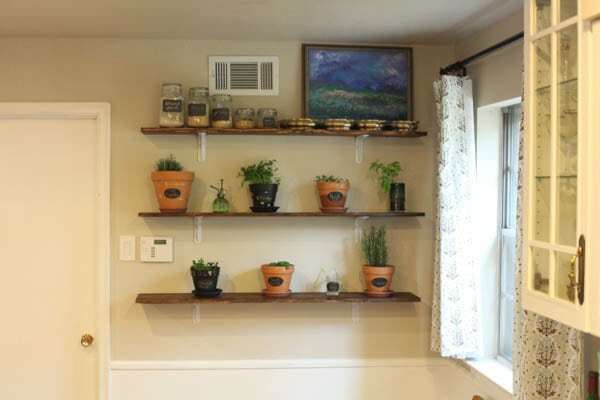 I need to add some plants to my home and edible ones would be even better!